Intensive 6 days/3 weekends Classroom/LVC Training and 3 months LIVE Project mentoring. Machine Learning (ML) is a different approach where computer learns the rules of solving complex problems without explicity programmed. Machine Learning algorithms are at the core and important piece of data science. Machine Learning Expert course is designed in accordance with IABAC™ (International Association of Business Analytics Certifications) to provide a theory and application of popular Machine Learning algorithms in Supervised , Unsupervised and Deep Learning. Major algorithm are discussed in more details about how they work and apply these algorithm with real world data. Finally, we create ML models with Python Scikit-Learn package in solving business problems and case studies. This will give you a complete knowledge on Machine Learning algorithm, how they work, how to optimize, advantages and disadvantages of each algorithm along with practical application. Machine Learning Foundation course from IABAC or equalivent demonstrable ML skills. In recent years, Machine Learning has taken over a main stream business and evolved has a career track by itself. A quick search in job portals reveals about 20,000 Machine Learning job opportunities on daily basis in USA alone. This course provides you with practical knowledge in Machine Learning on choosing ML algorithms to optimization Machine Learning models, which enables to deliver data science projects effectively. Who should choose this course - Machine Learning Expert? This course is a expert level course and candidate seriously pursuing career in Data Science can opt. This course provides a expert level knowledge in Machine Learning opening a world of opportunities in domain of Data Science, Artificial Intelligence, Robots etc., This course enable candidates to further master the topic with various real world project available in crowd sourced platforms such as Kaggle. As a part of the course, an certification assessment is conducted and candidate achieving minimum qualifing score receive a global certification, carring immense value of the testimony of Expert Level ML knowledge. 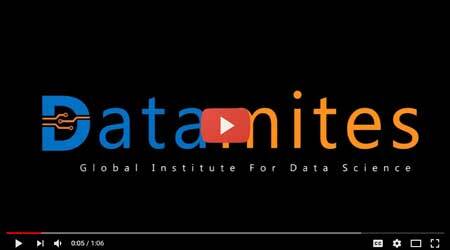 At DataMites™, we truly believe and very excited about this big wave of Data Science. DataMites™ work with globally renowned Machine Learning experts in designing as well delivering training course. There are millions of jobs and business opportunities in Data Science across the globe as of today and this is only going to increase exponentially in coming years. This course covers the following concepts. Types of ML algorithms : Supervised and Unsupervised.